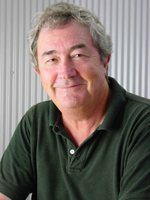 John Flanagan is the New York Times best-selling author of the Ranger’s Apprentice series, which won the Australian Publishers Association’s Book of the Year for Older Children and the International Success Award. John also developed a television sitcom called Hey Dad, which aired for eight years. He’s now a full-time author who lives in Australia. Matthew Peterson: Hey! You’re listening to The Author Hour: Your Guide to Fantastic Fiction, which can be found at www.TheAuthorHour.com. I’m Matthew Peterson, your host, author of Paraworld Zero. My next guest is John Flanagan, the New York Times best-selling author of the Ranger’s Apprentice series, which won the Australian Publishers Association's Book of the Year for Older Children and the International Success Award. John developed a television sitcom called Hey Dad, which aired for eight years, and he’s now a full-time author who lives in Australia. Thanks for being on the show today, John. John Flanagan: Well, thanks for having me, Matthew. Matthew Peterson: I’m actually a little bit interested in that show that you did, Hey Dad. How long ago was that show? John Flanagan: Probably mid ‘80s to early ‘90s I guess. But Hey Dad was a family sitcom about a widower who had, how many kids did he have? [laughs] three, three kids . . .
Matthew Peterson: It’s been a while. John Flanagan: . . . and raising three kids. And we ran through ideas, we did 291 episodes. Last time I looked, it was something like the fifth longest running sitcom anywhere. John Flanagan: . . . leaving out cartoon shows. It was great fun. Matthew Peterson: Well, Hey Dad was family-friendly and your books are also family-friendly. Did your experience with doing Hey Dad help you in writing the Ranger’s Apprentice? John Flanagan: Certainly in writing story structure, yeah, discipline and planning. Matthew Peterson: What gave you the idea to write the Ranger’s Apprentice? John Flanagan: Never intended for it to be a book in the first place. I had a son that at the time he was 12 years old, he’s now 32. And my wife, my two daughters and myself were all mad readers and Michael wasn’t. And I wanted to get him interested in reading. So I thought, “I’ll start writing a series of short stories and base the central character on him.” The other problem that he had in life was he’s small, was small. And he felt disadvantaged by that. I wanted to do two things: show him that reading could be interesting, enjoyable, fun, exciting, but also create a hero who wasn’t an Arnold Schwarzenegger type. So I started writing the short stories and I kind of tricked him by saying, “Look, I’m thinking of writing some stories for kids. Would you mind reading them for me and see if they’re any good?” And he was happy to do that, and he sort of quickly identified with the character. And the reason it was an archer and the reason they’re set in medieval times is archery is one of Michael’s big interests. We used to shoot together. So I used a lot of his character traits and personality traits. There were 20 short stories. I wrote a story a week and put them away for about 12-15 years while I worked on Hey Dad and during that period my daughter said, “Why don’t you do those as a book?” And I looked at them and thought, “That’s a good idea.” And that’s where the book idea started. It went through a lot... changed and upgrading and making the actual language a little older. Matthew Peterson: Well, the question that goes through my mind is you had this great idea to help your son to get into reading. Now he’s in his 30s. Did it work? Is he still reading? John Flanagan: So I loved it. Matthew Peterson: Well, tell us a little bit about the Ranger’s Apprentice, for the people listening that have not read your books yet. John Flanagan: The Ranger’s Apprentice is a guy called Will. Initially he has no surname because he’s an orphan. His father was killed in battle, which was all he knew about his father. He didn’t know who his mother was. He was found on the steps of Castle Redmont with a note saying, “Look after him.” And he’s taken to an area called the ward, which is... the Baron of Castle Redmont is about a kindly man who feels obliged to help the offspring of any of his servants or people within his fief who lost their life in the service of the fief. So Will was raised in the ward with a group of other orphans. Will’s small, which is coincidentally, as my son was, but he’s convinced that his father was a brave knight and he wants to be a knight. And when the time comes for him to choose, he applies to battle school--which is where warriors or knights are trained--and is rejected because he’s too small, which he finds devastating. It’s all he’s ever wanted. Instead, he’s apprenticed to a rather mysterious character called Halt, who’s the local ranger. Will is quite nervous about the idea of being apprenticed to this guy, ‘cause he’s a very humorless, very unsmiling, very mysterious person. But as the story develops, he starts to really enjoy being on the inner circle and learning to use a bow and given his own horse. The horse is a sort of fairly key character in the book. He actually has conversations with his horse, which are in his mind, of course. And you never know if that’s what the horse is really thinking or not. But he grows to really treasure being a ranger’s apprentice and then grows to want to become a ranger. And that covers the first four books of the series. Book six has just been released not long ago in the United States. Five and six are a separate story which is set a few years later which the story of his first assignment as a ranger in his own rite. Matthew Peterson: So he’s finally a ranger then in those books? John Flanagan: He’s a ranger, yeah. I realized when I did that, I’d left out an important part of his life. So book seven which is due for release in the states next February, goes back to the point in time where he’s about to graduate as a ranger. So it is a flash back. Matthew Peterson: Well, that’s always fun to go back and to get a book that was, you know, further back in the past before things had happened. Now, I hear that you just did this humongous tour in the U.S., not this year, but maybe the previous year. I know in the U.S. they have like a van or a bus that they . . .
John Flanagan: It’s what’s called the authorless, the return to Araluen tour has just recently finished. There [was] a minivan, like an eight-seater bus, painted in the ranger’s colors, and it was a group of actors who did the book presentation, which involved kids. It went to schools, bookstores; they did signings. I signed something like 3,000 book plates, which are sent over and got stuck in books, but the actors as well, stayed in character for the whole thing, and I think they might have signed those characters. I’m not sure. John Flanagan: Fantastic presentation! Very imaginative, and very exciting, and it seems to have been very successful. They did that and in March of the previous year, 2008, I did a tour of about 15 days in twelve cities [in the U.S.]. The books seem to be very popular in Texas. John Flanagan: I did a presentation at the Texas Librarians Association which, wow, Texas librarians. I had this vision of a room full of dixie chicks. John Flanagan: [laughs] Which is quite a hoot. Matthew Peterson: That’s funny, yeah, ‘cause you know Texans have their own accent as well. John Flanagan: And it’s a pretty distinctive one, a pretty obvious one, you know. Matthew Peterson: Yep, yep. When you do these tours and stuff, do you ever bring a bow and arrow and . . .? John Flanagan: I used to when I was doing tours in Australia. My bow is 6 feet long. John Flanagan: Hang on, going in the hold, doesn’t need a license for this, it’s not any kind of pyro-technic... okay, ready for the next question, “Why are you taking a long bow to Queensland?” [laughs] If you think about what chaos you go through in airports in America, that all security searches, it would have been just unbelievably difficult to take it with me. John Flanagan: And he had to ring my publicist and said, “Please will you tell the police I’m going to a book launch.” They released him, but they kept his sword. Matthew Peterson: Oh, they kept it. Matthew Peterson: No hecklers please. I am armed. Matthew Peterson: [laughs] Well, I have done a little archery. I was in Boy Scouts of America. Matthew Peterson: Got my archery merit badge, and I remember the very first time I ever did a bow I got this big raspberry down my arm ‘cause I didn’t realize how to hold it correctly. John Flanagan: Oh! [laughs] The oldest problem, that huge wack on the arm. I think there’s a scene in book one where he says, “Can I fire it?” and Halt says, “If you think that’s a good idea.” Which becomes his catch phrase for “it might not be.” But Will takes quite a while to wake up to it. John Flanagan: But nothing hurts more than that. Matthew Peterson: Yeah. [laughs] Well, John, it’s been great talking with you. I really do like talking about weapons and bow and arrows. Matthew Peterson: And people who do enjoy those type of things, I think they’ll love your books. Well, we have a commercial actually coming up. I’ve been speaking with John Flanagan, the New York Times best-selling author of the Ranger’s Apprentice series. Thank you so much for being on the show today, John. John Flanagan: Thanks very much for having me, Matthew. Matthew Peterson: Alright, so go to www.TheAuthorHour.com to listen to the bonus questions. Don’t go away. I’ve still got James Dashner coming up next.